A father who killed his 14-month-old son because he was crying has been jailed for nine years. 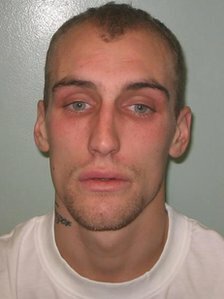 Nathan Allen, 27, of Romford, told the Old Bailey jury he had hit Fletcher twice in the stomach in January as he lay in his cot because he was crying. Allen was jailed for manslaughter, which he admitted at the start of the trial. He was cleared of murder. Fletcher Allen died in an east London hospital in January from internal bleeding caused by an abdomen injury. The jury heard the father had been alone with his son for half an hour when he attacked the child. Fletcher’s mother Danielle Hands, 19, had gone to visit her family leaving the toddler in his care. Allen told the murder trial: “He was screaming and clinging to my arm. He added that he realised his mistake immediately and said “sorry Fletcher”. Sentencing Allen, of Erith Crescent, the Common Sergeant of London, Judge Brian Barker, said he did not fully accept the killer’s explanation, as the child had had extensive bruising. He said: “Your reaction was aggressive and extreme. You will have to live with your actions for the rest of your life. The court heard Allen initially lied to the police claiming the child had drowned in the bath. Police said a post-mortem examination had found older fractures to two of the toddler’s ribs and bruising to his face, neck and torso. Referring to the fatal attack, he added: “A vicious attack took place during which this defenceless 14-month-old baby suffered another fractured rib, trauma to both kidneys, internal bleeding and numerous bruises to his body, head and face, including what can only be described as a sadistic bite to Fletcher’s face.